Sunday, June 23, 2013 -- Riders Slam Jam -- Wilson County Fairgrounds -- 2331 Highway 301 South, Wilson,NC -- Top 75 Grand Champion Event with Major Speciality Awards and Stereo Competition. Call Rolling Riders at 919-975-7212 or e-mail RollingRidersMag@aol.com. 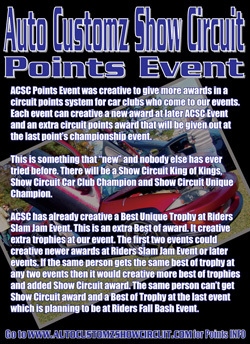 ACSC Points Event was creative to give more awards in a circuit points system for car clubs who come to our events. Each event can creative a new award at later ACSC Event and an extra circuit points award that will be given out at the last points finials event. This is something that "new" and nobody else has ever try before. There will be a Show Circuit King of Kings, Show Circuit Car Club Champion and Show Circuit Unique Champion. ACSC has already creative a Best Unique Trophy at Riders Points Battle Show. This is an extra Best of award. It creative extra trophies at our event. The first two events could creative newer awards at Riders Points Battle Show or later events. If the same person gets the same best of trophy at any two events then it would creative more best of trophies and added Show Circuit award. The same person can't get Show Circuit award and a Best of Trophy at the last event which is plan to be at Riders Fall Bash 2012. For Riders Slam Jam 2013 under King Of Kings Only: Playoff rules has to start on June 23 for Display, Time Enter and how many trophies you can bring from pass events that you won. What change for the Circuit for 2012 is Riders Slam Jam become the "second" event for the first time that puts Riders Points Battle Show the Third event that falls under Creative Awards rules. What change this RSJ Riders Slam Jam 2012 is headed back to Wilson County Fairgrounds has a full Auto Customz Association event. The 2010 and 2011 was not an ACA events because ACA was made in August 2010; the permit for 2011 event didn't allow ACA quantification so it was run under Riders Slam Jam 2009 permit. What this has done is saying we will have a Riders Fall Bash 2012. New for 2012 -- We going to be doing a "Lottery Choice Award Trophy" where who pays to show in the car show will get draw to win a major size trophy. More details are coming soon. Set for March event only. What's for 2011 Circuit is "time enter" can decide each Points Championship Title at all events but Riders Slam Jam 2011, At Riders Slam Jam 2011 would go on judge score only. Time Enter is base when each ride docks what time they got to the event. Right now, Judging will be re-total per event. No database or rollover totals at this time. Anybody who gets Any Best Of Trophy will be added to the list. Anybody who shows at any first two events but didn't get a Best of Trophy then turns around and gets a Best of Trophy at "Riders Points Battle Show" will be added to the list. The "WINNER" will be base on who comes to all events with the highest score. This is for the Car Club who shows the most rides at All Events. There could be a showdown at "September 29 event" to see who is "The Club", Riders Slam Jam King of Clubs could creative more points if the club is already in. The first two events would show which clubs are leading but Car Clubs can gain points after September 29 event by enter events afterwards. This could get interested because it becomes a playoff. Any ride who scores very high in judging will get an extra point. We will decide what the score will be at the first two events. Paint and modification will be most look at. After the first two events then mid 70 judge 73-75 poInts score each ride an extra point. Five rides at one show or 3rd club enter the race. Anybody who gets Any Best Of Trophy that has "UNIQUE" Custom look will be added to the list. Anybody who shows at any first two events but didn't get a Best of Trophy then turns around and gets a Best of Trophy at "Riders Points Battle Show" will be added to the list. The "WINNER" will be base on who comes to all events with the highest score. New Name ACSC Points Champion base on what ACSC NC Juding Staff see it will become a Points Award. This could also creative an extra best of at any ACSC Points Event. After the first three events then it comes into effect if the same people or the same type of vehicle shows. Who in this selection could rollover to "KING OF KINGS" if who in that selection drops out but "not" showing. © Copyright 2003-2012 Rolling Riders Inc.